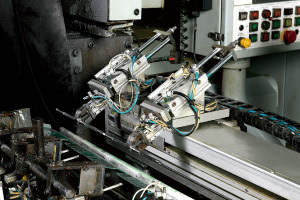 By developing unique machines which achieve both high precision and high efficiency, we push the envelope of quality and productivity. 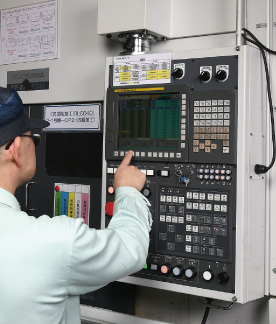 Our unique high-precision, high-efficiency manufacturing facilities give concrete form to the technological prowess aspect of the Kyowa Standard. 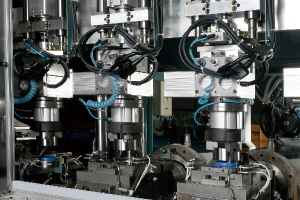 Achieving satisfactory quality at 0.001-mm precision calls for drawing on solid technology and knowledge in building proprietary manufacturing systems. Accordingly, our manufacturing facilities consist almost entirely of equipment developed in-house. Every stage of the construction of our assembly lines is also controlled internally, from materials procurement to finishing and installation. And through automation and otherwise streamlining human involvement, we achieve unheard-of productivity levels per floor-unit. Guided by principles of self-sufficiency in infrastructure which balance quality with productivity, we design the most practical and the most highly reliable manufacturing processes in order to make the products with which our customers will be satisfied. We also thoroughly assess our manufacturing structures for person-friendliness, including but not limited to environmental impacts and comfort and safety in operation. Various machines designed in-house play their part in our pursuit of precision processing and improved cycle time.